Experts believe new round of sanctions adopted by U.S. Department of the Treasury may become the most serious sanctions ever to be leveled at contemporary Russia. On July 16 the United States imposed a third round of sanctions upon Russia to punish Moscow for what the U.S. sees as its continuing failure to take concrete steps to de-escalate the situation in eastern Ukraine. Whereas previous sanctions mainly targeted individuals, the new measures are aimed at companies. Besides Rosneft and VEB, the sanctions list now includes Russia's largest private energy company Novatek and the state-owned Gazprombank. These companies will now be unable to attract funds from American investors and creditors for longer than three months. Under the new rules, the assets of these companies will not be frozen, and American industry players will not be forbidden from working with them. “We will feel the effects of the new package of American sanctions against Russian companies and individuals considerably more, when compared to the previous two rounds,” said Vasily Ukharsky, a macroeconomic analyst at UFS IC. “The companies that ended up on the list are very large companies that form the backbone of the system and have government support,” said Ukharsky. According to him, the sanctions imply that Rosneft, Novatek, VEB, and Gazprombank will be deprived of access to borrowed capital in the United States. Enterprises in the military-industrial complex, meanwhile, are looking at a complete suspension of all cooperation and frozen accounts with American banks. Affected entities include the air defense concern Almaz-Antey, Kalashnikov Concern, Izhmash, and other factories, plus important industrial players KBP Instrument Design Bureau and NPO Mashinostroyenia. 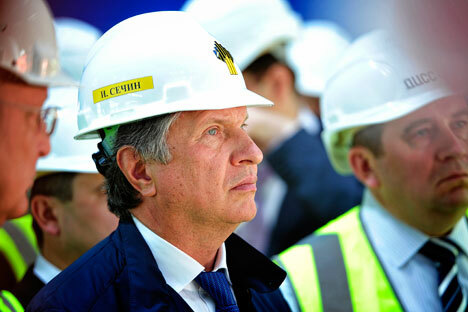 Of the companies on the sanctions list, Rosneft is the most integrated with the American economy. In particular, it has a key partner in the American firm ExxonMobil. The two companies collaborate on oil production projects on the Far East shelf in the Sea of Okhotsk. Moreover, not long ago, the Russian company made a bid to purchase Morgan Stanley's oil trading division. “Rosneft has a 'financial pillow' of $20 billion, but this isn't very much for such a large company,” said Veniamin Vutyanov, assistant professor of economic regulation at the Russian Presidential Academy of the National Economy and Public Administration (RANEPA). Vutyanov believes this puts the company in a difficult situation, which will be reflected primarily in its stock price and cost of financing. According to his sources, lawyers from Rosneft and ExxonMobil are currently engaged in negotiations over how to resolve questions of finance pertaining to their joint ventures. Investcafe analyst Grigory Birg believes that ExxonMobil will be unable provide new or additional debt financing for its projects with Rosneft. Neither will it be able to increase its share in the projects or buy a stake in their new subsidiaries. In the case of Novatek, Birg sees the immediate impact of the sanctions in American companies' inability to finance either Novatek or its Yamal LNG project. After the opening of the Moscow Stock Exchange, Rosneft shares immediately fell by 5.4 percent, and Novatek dropped by 8.87 percent. The RTS index lost 4.6 percent overall. Much more serious sanctions may affect the banking sector. “About 60 percent of VEB's funds are raised on open markets, and the other 40 percent are from state investment,” said Vasily Ukharsky. Of those assets, the bank has received up to 80 percent from American and European markets, and only 20 percent from China and other countries. American money has formed the basis of the bank's long-term resources for more than a decade. Furthermore, the American sanctions directly influence opportunities to raise funds through bonds. “Currency bonds make up 10-12 percent of VEB's net liabilities, and 7 percent of Gazprombank's. Sanctions will not affect their operating stability, but will create a great amount of uncertainty for Russian players all the same,” said Alexander Abramov, head researcher at RANEPA's Center for Financial System Analysis. Abramov stresses that Sberbank (Russia's largest bank) will have to rewrite the sovereign risk section of its investment memorandum in order to take part in the Eurobond market. In turn, Gazprombank is the main underwriter that helps Russian issuers place Eurobonds. “Therefore, the sanctions may infect the projects of other organizations that have absolutely no relationship with either VEB or Gazprombank,” Abramov said. European countries, for their part, have still not joined the U.S. in seriously widening sanctions. However, the European Council has requested that the European Investment Bank (EIB) and European Bank of Reconstruction and Development (EBRD) suspend the authorization of new operations for Russia. In 2013, the EBRD financed projects to the tune of $2.64 billion, and the EIB contributed $1.4 billion. The greater part of these funds was directed towards implementing the largest investment projects. However, Russian government figures are still not inclined to dramatize the situation. As Vladimir Putin stated after the closing of the BRICS summit, sanctions against Russia will harm America's own companies. “The measures taken by the [American] administration, in my view, clash with the national interests of the United States itself. Large corporations want to work in Russia, but in facing certain restrictions, they will lose their competitiveness with other global energy companies,” he said.